The new website sees tradition and innovation blended perfectly in the graphic design: uncluttered, elegant and with that customary touch of sporting appeal, visitors are given a smooth and straightforward overview of the Maserati models, the main focus of the site content. 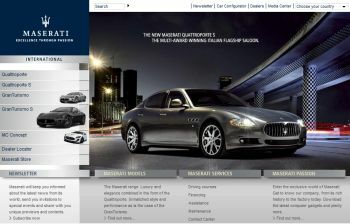 Maserati has launched an all-new website in conjunction with the Paris Motor Show. The new website sees tradition and innovation blended perfectly in the graphic design: uncluttered, elegant and with that customary touch of sporting appeal, visitors are given a smooth and straightforward overview of the Maserati models, the main focus of the site content. Technical specifications illustrate the engines, exteriors, interiors and customized features in full detail. Improvements have been made to the car configurator, which "usability" engineers consider to be one of the best in the world. The advanced multimedia capacity is confirmed by the download area, integrated in the car navigation pages and packed with videos, pictures and screensavers. A new section, Maserati Service, provides detailed information on pre- and after sales services such as finance, vehicle insurance and maintenance services. Maserati Passion, the third main area in terms of content, traces the myths and legends of motor racing, past and present. In an environment tailor-made for racing and car enthusiasts, you can browse through motor racing legends and supercars of the past, or visit the section Maserati Corse, dedicated to the championships in which Maserati cars take part. The Passion area also features the Maserati Club, an absolute must for anyone wanting to take part in events dedicated to fans of the Modena manufacturer.